The Telegraph is an English-language daily newspaper founded in 1982 and is Eastern India's largest circulated and read English newspaper. 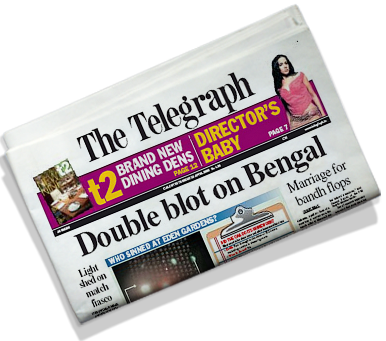 The Telegraph comes in seven different markets: Calcutta, South Bengal, North Bengal, Northeast (Guwahati split), Jharkhand (Jamshedpur and Ranchi splits), Orissa (Bhubaneswar split) and Bihar (Patna split). Each market has a local editorial team thus ensuring local coverage along with essential national, international and sports coverage. It is a Fashion, Lifestyle and Entertainment tabloid newspaper and is available Everyday. All the hard and breaking city news in TT Metro on all days of the week. It is a special section on Mondays on Science, technology, gadgets and gaming. Your single window to the job market in Jobs on Tuesdays. It is your CAMPUS BUDDY with campus trivia, facts, stories, courses, opportunities and anything & everything related to student life. Available every Tuesday. Insightful details and topmost stories of the week in Graphic on Sundays. A refreshed section for Book-lovers with reviews of books of every genre. Available every Friday. GLAMOUR is specially curated section for WOMEN with beauty tips, fashion, skin-care, health concerns. Available every Thursday. It is section that takes deep-dive into topics of Personal Finance. It also has Mutual Funds tracker. Available every Monday. Get all HEALTH related information; exercise, yoga, food or common ailments; with this section Every Wednesday. The All NEW Entertainment Section with Bolly'wood' & Holly'wood' stories & more news from tinseltown in a power-packed page. Available from Monday-Saturday.